Don't trust just any accessory for your cellular phone. Duracell is a name you have been trusting for years with your most prized possessions. Don't plug your expensive cellular phone into a low cost accessory, and risk the possibility of overheating your phone by using a sub-par product. Make the SAFE choice and choose a name that customers have been choosing for over 90 years, DURACELL! If 90+ years in business is not enough, Duracell will guarantee your connected equipment with a $2,500 Warranty against voltage surges or spikes (Certain Restrictions Apply) with any Duracell Hi-Performance product. To top it off , any product purchased from our authorized online retailer Innovative Trends Corp will be backed by our friendly 24-Month Guarantee. Make sure you are buying quality AUTHENTIC DURACELL products! 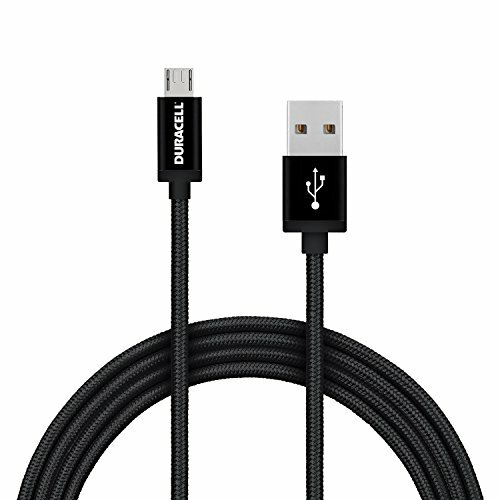 The Duracell Hi-Performance 6 Ft Micro USB Nylon Braided Fabric Cable is Fast/Rapid Charge 2.1 Amp Ready. It can Sync and Charge with Samsung, Motorola, Blackberry, HTC, LG, Nokia, Pantech, Droid, Sanyo, Kyocera, Kindle, Nook, and most smartphones, e-readers, & tablets. Don't trust just any accessory for your cellular phone. Duracell is a name you have been trusting for over 90 years with your most prized possessions. Durable Nylon Fabric - Stronger and more flexible Duracell nylon braided fabric cables are stress and stretch resistant, tangle free, and help protect against daily wear and tear. Micro USB connection works with Samsung, Motorola, Blackberry, HTC, LG, Nokia, Pantech, Droid, Sanyo, Kyocera, Kindle, Nook, and most smartphones, e-readers, & tablets.